The modular design of the 500 lumen Mk4 weapon light provides interchangeable switch options to meet a wide variety of battlefield needs. The low-profile design places the light close to the weapon body nearly eliminating the rifle barrel shadow and enhancing weapon handling switchology. The Mk4 can operate on two CR 123A batteries or one rechargeable Li-Ion battery (sold separately). Special deal: the Mk4 is available directly from Steiner for $299.00. Click store button below. Yes any Steiner pressure switch will work with the battle lights. I have a Mk4 Battle Light with the tailcap that has a push button and connection port for a remote switch. Since I usually don't use a remote switch, I was wondering if there is a little plug sold to keep debris out of the remote switch port. Thank you. We do not have a plug for that. 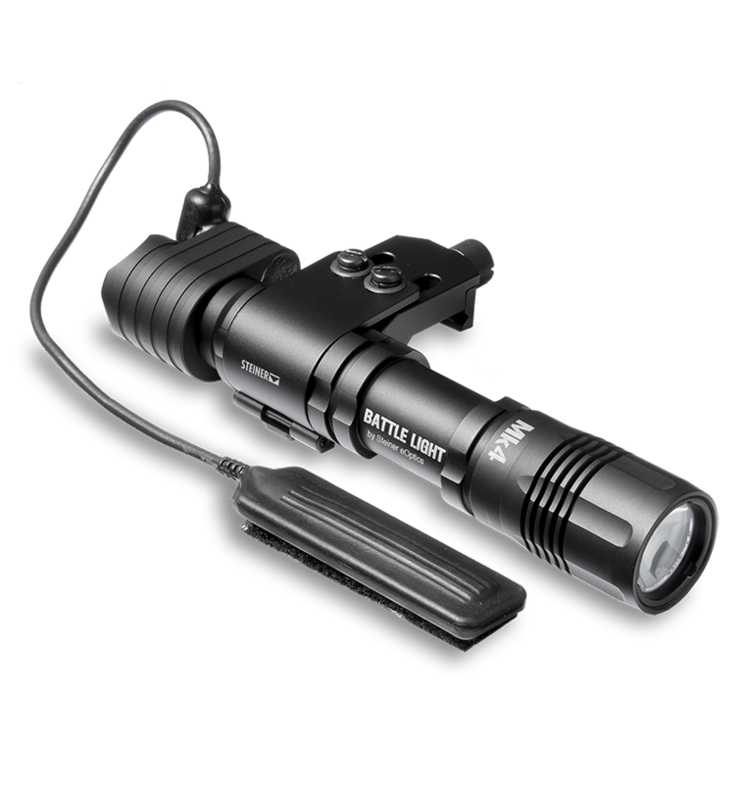 The battle light has a 3 year warranty that will cover LED malfunction. How far will the mk4 light illuminate? I lost the remote pressure pad for my MK4 Battle Light. Can I purchase just the pressure pad? As for batteries, just the CR123's. For the pressure switch, shoot us an email to customer-service@steiner-optics.com and we will send you a replacement pressure switch. The MK4 pressure switch is a stick on hook and loop pressure switch. We do not offer a hard mount for the pressure switch onto a rail. Does the Mk4 Battlelight work with the visible override feature of the DBAL-A3? If so, how do you connect it, and what does it do? If you already have an A3 all you'll need is a &quot;Y&quot; remote cable in one end of the A3 override port, and the other in the MK4. When the paddle switch is activated both the A3 visible and MK4 LED will turn on.